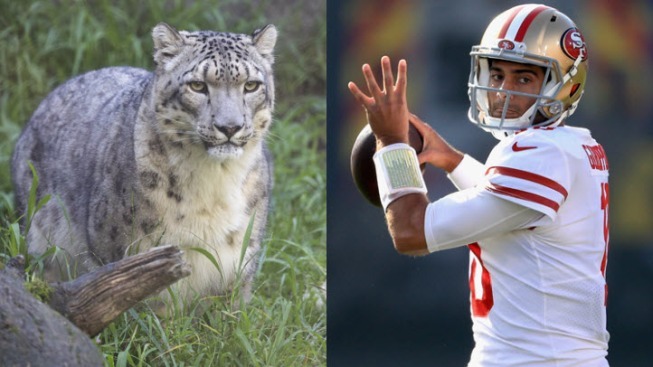 The San Francisco Zoo has named its new snow leopard "Jimmy G" after the popular 49ers quarterback. If you can't wait for the NFL season to see popular San Francisco 49ers quarterback Jimmy Garoppolo then head to the zoo. He's there. The San Francisco Zoo has named its new snow leopard "Jimmy G," following its tradition of naming animal after athletes from Bay Area sports teams. In 2011, the zoo named a hippo after then San Francisco Giants closer Brian Wilson. Remember him? That bearded guy who helped win a World Series before joining the rival Los Angeles Dodgers. In 2013, a rhino was named after then 49ers lineman Alex Boone. In 2014, two newborn calves were named after more beloved San Francisco Giants players: ace pitcher Madison Bumgarner and outfield star Hunter Pence. And heads up: The SF Zoo and Gardens is offering free admission to mothers who come to the zoo with their children on Mother's Day, this Sunday, May 13. For more information on snow leopards, visit the SF Zoo's website.